This one bedroom house replaces a derelict stable building on a small side road in Hackney. This tight urban site yields a modest footprint that necessitates building up to its boundaries. Only a small slither of ground is relinquished. At ground floor level the simple brick front elevation wall tapers and offers back a thin wedge of garden to the street, suggestive of the domesticity beyond its defensive shell. Behind the concealed street door hides the smallest of courtyards leading to an entrance, bedroom, bathroom and kitchen. Elevated above street level, the first floor is reserved for the main living space with views overlooking the chaotic yards of the adjacent terrace, the streetscape and the more tranquil gardens of the of what used to be the Mothers’ Hospital. Angled view from street with bicycle in foreground. 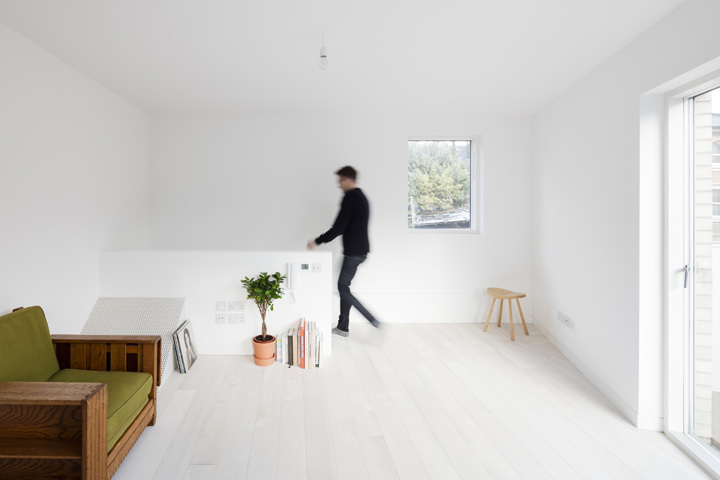 One Bed House in Hackney, London, United Kingdom. Architect: EDRM, 2015. 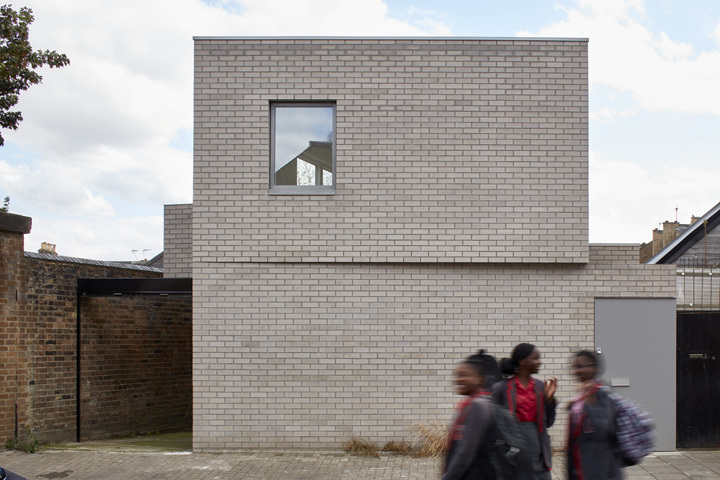 Elevation from street with school kids passing by. One Bed House in Hackney, London, United Kingdom. Architect: EDRM, 2015. View of main living space and person going down stairs. One Bed House in Hackney, London, United Kingdom. Architect: EDRM, 2015.